The Turkish occupation army passes to Kobanî canton lands amid mobilizing its troops. Hawar news agency’s reporter stated that the Turkish occupation army passed Kobanî canton lands at 21:30 from two points west of Kobanî which are Siftek and Bobanî villages. The reporter noted that the Turkish occupation mobilizes its forces on the border and within military points in addition to the two points in Kobanî that they passed to the canton from . The Turkish-German Police Chief who was removed from duty for working for MİT is revealed to be Döndü Yazgan. Yazgan used to attend meetings by pro-AKP institutions frequently. Her last position was the Wiesbaden Police Harmony Chief. The Welt am Sonntag newspaper published on Sundays in Germany published an article yesterday about a Turkish-German police chief stationed in the state of Hessen frequently meeting MİT agents and that the chief in question had since been removed from duty. The Turkish-German police chief’s true identity hadn’t been revealed and she was referred to as “Semra Melek”. The article stated that she contacted the MİT over the Turkish consulates in Frankfurt and Mainz. Sources from Hessen who spoke to the ANF on condition of anonymity state that the police-chief-turned-MİT-agent is Döndü Yazgan. Wiesbaden Police Harmony Chief Döndü Yazgan had a tight relationship with the AKP regime in recent years. One of AKP’s flagship newspapers, the Sabah, frequently published praising articles on Yazgan, who was also an important personnel for the Union of European Turkish Democrats (UETD) and DİTİB, two of the Erdoğan regime’s institutions in Germany. Yazgan frequently visited DİTİB’s Central Mosque in Wiesbaden. 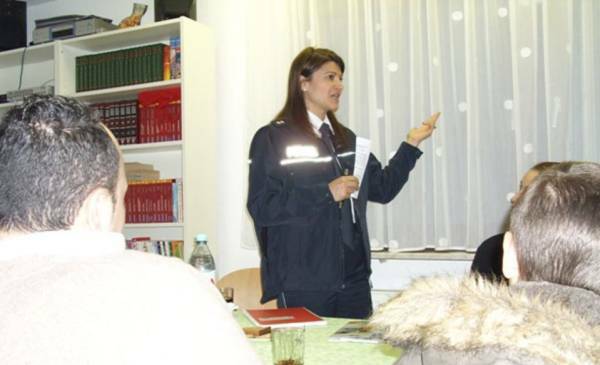 Yazgan participated in the female congregation’s meetings and events as a police chief, supposedly carrying out this activity as part of “harmony efforts”. Police Chief Yazgan acted as a bridge for the joint projects the Turkish and German police carry out. Most recently, Yazgan led the joint efforts between Mainz and Wiesbaden police and the Turkish police in December 2016. She acted as the moderator in a workshop titled “Together for security” on December 9, 2016, and Security Affairs Directorate Foreign Relations Vice Chair İlyas Özgentürk, Public Security Branch Vice Chair Raşit Poyraz, Siirt Community Policing Director Mustafa Durmaz and Çankaya District Police Chief Rüstem Özbek attended the workshop. Police Chief Yazgan was the star in activities of the UETD, AKP’s lobby organization. Yazgan attended UETD and DİTİB events in and around Wiesbaden, and attended former Frankfurt Consul General İlhan Saygılı’s farewell visits to the Turkish community along with UETD Frankfurt official Abdul Akpinar. Döndü Yazgan was born in Ankara, and moved to Germany when she was very young. Her career in the German police began in 1994. After she invited Turkish security units to visit Germany in December last year, German intelligence launched an extended security investigation on Yazgan. The report prepared after the investigation pointed to Yazgan’s relationship with the MİT agents in Germany. Welt am Sonntag wrote in yesterday’s edition that after the report in question was sent to the German Interior Ministry, Hessen State Police Director Sabine Thurau and Hessen State Office for the Protection of the Constitution Chair Robert Schäfer intervened. Both police chiefs requested the removal of negative statements about Yazgan from the report. By early July, MİT’s attempt to infiltrate the German domestic intelligence organization, the Federal Office for the Protection of the Constitution, was exposed. MİT attempted to carry out the infiltration over job applicants to the Federal Office for the Protection of the Constitution, the intelligence office posted job openings and the Turkish-speaking applicants turned out suspicious in the inquiry. German intelligence considered the applicants’ ties with the MİT and rejected the applications. The MİT had attempted to infiltrate German police and intelligence agencies in the past through Turkish interpreters, and many interpreters were exposed and removed from duty. A former British soldier who fought against Isis in Syria alongside a Kurdish militia faces terrorism charges after being arrested in Turkey while on holiday with his girlfriend, The Independent has learned. Joe Robinson was detained at the resort of Didim, on the Aegean coast, with Mira Rojkan, a Bulgarian living in Leeds, along with her mother who had accompanied them. Both the women were subsequently released, but the Turkish authorities have stated that 23 year old Mr Robinson, from Accrington in Lancashire, is being investigated in connection with terrorist offences and is likely to face charges. The government of Recep Tayyep Erdogan is engaged in an increasingly violent conflict with Kurdish separatists in Turkey and Syria, and thousands of Kurdish nationals are in jail under a state of emergency. Mr Robinson has served with the YPG, the armed wing of the Syrian Kurdish Democratic Union Party which has repeatedly clashed with Turkish troops operating in Turkey, as well as its allies in the PKK in Turkey. Ms Rojkan, who studied law at Leeds University, and had carried out voluntary work for Amnesty International, was questioned by Turkish officials on whether she had any links with subversive groups. The country director for Amnesty International was arrested earlier this month in Istanbul with a number of other human rights workers. More than 50,000 people remain in prison in the country in the crackdown which followed last year’s failed coup. Mr Robinson, who had served with the Duke of Lancaster’s Regiment in Afghanistan in 2012, decided to join in the fight against Isis in summer 2015. He was arrested at Manchester airport on suspicion of terrorism offences when he returned five months later. He was subsequently on police bail for 10 months but no charges were laid against him. The Foreign Office in London said: “We are aware of the detention of a British national in Turkey and have requested consular access”. A Turkish defence official said: “The YPG is the PKK by another name and the PKK is considered a terrorist organisation not just by us but the UK as well. Of course anyone fighting with a terrorist organisation will be investigated and there is a strong possibility of charges and a long sentence if he is found guilty”. Mr Robinson’s Facebook page, which charts his journey from the Bulgarian capital, Sofia, to Didim with Ms Rojkan, was closed down yesterday. Mr Robinson had said he had joined the fight against Isis after being deeply affected by atrocities committed by the Islamist extremists and the tipping point was the beach attack at Sousse in Tunisia in which 39 British tourists were murdered in June 2015. The following day he left the country after telling his family that he was going to join the Foreign Legion in France. Last year, in newspaper interviews, he spoke about his motivation for joining the YPG and his reaction to being detained by British police. “I went to Syria to fight against terrorism and to protect the civilians caught up in the fighting who had to endure the most horrendous experience and living conditions imaginable” he said. 39 people arrested in the ISIS trials were released yesterday in Antep. The wife of Yunus Durmaz, who is known as the suicide bomber who planned the Suruç and October 10 Ankara attacks, was among the suspects released in the hearing held yesterday in Antep High Criminal Court No:8. Yunus Durmaz, later announced as the “Turkey Emir for ISIS”, had blown himself up during an operation on a house in the Şehitkamil district on May 19, 2016. His wife Nesibe Durmaz was detained by the police then and later arrested. Several others had been detained as part of the same investigation and an indictment was prepared for 60 of them. The fifth hearing of the case was held in the Antep High Criminal Court No:8. All suspects and their lawyers completed their defenses. The court issued an interim verdict to release 39 suspects including Yunus Durmaz’s wife Nesibe Durmaz on probation and continued arrest for 21 suspects including Yunus Durmaz’s brother Hacı Ali Durmaz. The funeral ceremony for the YPG’s 4 internationalist martyrs, Martyr Demhat Goldman (Robert Grodt from US), Martyr Soro Zinar (Luke Rutter from UK), Martyr Rodi Deysie (Nicholas Warden from US), and Martyr Zafer Qereçox (David Taylor from US) was held this morning in Derik. Hundreds of people attended the ceremony, which began with a military exercise saluting the martyrs. A minute’s silence was followed by speeches in Kurdish and English. Mothers carried the photographs of our fallen comrades as the martyrs‘ comrades carried those fallen on their shoulders to the border crossing in Semelka. Every single martyr for us is a promise for the victory. Our struggle against the terrorism of oppression and tyranny is a struggle that is in the name all humanity. Our struggle surpasses borders. We are fighting against the enemies of humanity. Serok Apo who lit the fire of freedom and revolution in Kurdistan once said that the movement is the movement of martyrs. Martyrs are our guides, our compasses, and our inspirations. With the martyrdom of Şehid Demhat, Şehid Soro, Şehid Rodî, and Şehid Zafer; we renew our promises for victory of freedom and revolution. They have come from lands that are far away and wanted to know about the truth of fire. Through the struggle, they discovered that the fire illuminates, warms, and burns. They revolved around it with their courage and dignity without hesitation and were united with the fire. They are like thousands of others the only ones who know now the truth about the fire and will illuminate our path on the way to victory. In the very presence of them, we promise that we will never deviate from this path. They have taken their places in the hearts of martyrs’ mothers and of the people of Rojava. We are proud of them. I myself met Şehid Demhat at the Occupy Wall Street protests in New York. He was a wonderful comrade and a true revolutionary who met the mother of his now four year old daughter while treating her as a street medic. When their daughter was born, she was called as ‘the child of the revolution.’ When he made the decision to join the Rojava Revolution, he knew that he might have to make the sacrifice he made. For him this sacrifice was not just about fighting fascism in the form of Daesh. It was also about providing peace not only for Rojava but also for all the Middle East and beyond. When Şehid Soro joined YPG he said that he did this because YPG stands for the best opportunity for peace in the Middle East. He showed a great interest in the subjects and participated actively in the academy. In the collective life of YPG, he always helped his comrades and was respected by all. We have never seen him yelling at someone, complaining about anything. He deeply knew about peculiarities of the Middle East and was always eager to learn new things. Şehid Rodi had already fought against the enemies of humanity in other parts of the world. But when he came to know about YPG, he also wanted to learn about Rojava Revolution. He was a true disciplined soldier and was a source of inspiration for all his comrades. He was generous in sharing his experiences and was self-giving in sharing responsibilities. He was a source of morale for everyone around him with his joy and sense of humor. Şehid Zafer was also a wonderful comrade with high ethical and intellectual standards. He was honest and courageous. His integrity was impressive. His humility was inspiring. He had said that ‘The Rojava Revolution is honorable because it wants to grant equal protections and freedoms to women and minorities. This is unique in the region.’ He had gladly taken Qereçox as his second nom de guerre and heroically carried to the end. We, as their comrades, will always be proud of them and will follow in their footsteps. There are already internationalist comrades who have taken their names. The fire of freedom and peace will continue to flame and spread to the Middle East and beyond. With this hope, courage, and determination; we say again Şehîd Namirin! Bîjî YPG and YPJ! Bîjî Serok Apo! »Man kann niemandem zu Investitionen in ein Land raten, wenn es dort keine Rechtssicherheit mehr gibt und sogar völlig unbescholtene Unternehmen in die Nähe von Terroristen gerückt werden.« Diese Worte sprach der Bundesminister des Auswärtigen, Sigmar Gabriel (SPD), als in der vergangenen Woche die deutsche Türkeipolitik »neu ausgerichtet« wurde. Trotz der fehlenden Rechtssicherheit, die Gabriel öffentlich anprangerte, sollen nach dem Willen des Bundesamtes für Migration und Flüchtlinge (BAMF) auch Oppositionelle weiterhin in die Türkei abgeschoben werden. Dem »nd« liegen Unterlagen vor, die belegen, dass der Asylantrag von mindestens einem bekannten türkischen Oppositionellen – es handelt sich um einen Politiker der linken prokurdischen HDP aus dem Grenzgebiet zu Syrien – abgelehnt wurde. Dem Mann droht die Abschiebung in die Türkei. Ende Juni wurde zudem der Asylantrag des türkischen Staatsbürgers Cano Boran* abgelehnt, der 2014 in Nordsyrien für die Kurdenmiliz YPG gegen den »Islamischen Staat« (IS) gekämpft hat. Auch das geht aus Dokumenten hervor, die dem »nd« vorliegen. Bekannt gemacht wurde der Fall von dem Menschrechtler Tobias Huch, der darüber am Dienstag auf seiner Facebookseite berichtet hatte. Das BAMF wollte sich trotz mehrmaliger Nachfrage des »nd« in der Sache nicht äußern. Cano Boran war im Herbst 2015 aus der Türkei nach Deutschland geflohen und stellte hier einen Asylantrag. Er befürchtet, in der Türkei eine mehrjährige Gefängnisstrafe wegen seines Einsatzes für die YPG beim Kampf um die nordsyrische Stadt Kobane absitzen zu müssen. 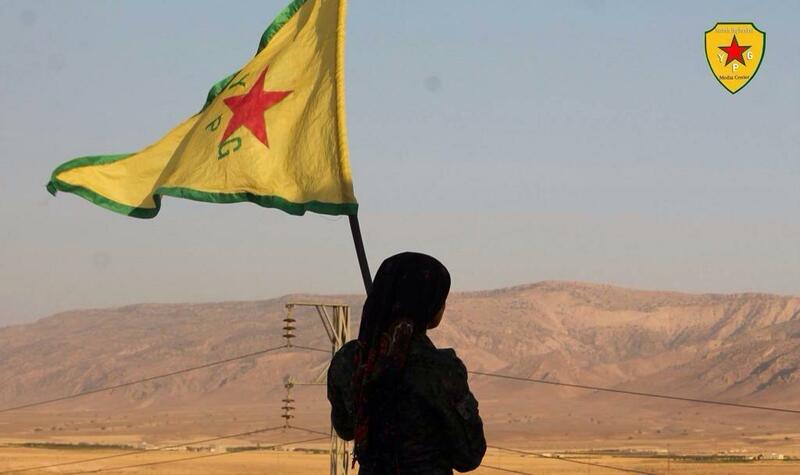 Aus Sicht der Türkei sind die nordsyrische Partei PYD sowie die zu ihr gehörenden Milizen YPG und YPJ Ableger der PKK. Ihre Anhänger werden als Terroristen verfolgt und bekämpft. Boran sagte gegenüber »nd«, er habe mithilfe zahlreicher Fotos gegenüber dem BAMF seinen YPG-Einsatz belegen können und ihm sei geglaubt worden. Doch spielte das für die Entscheidung der Behörde offenbar keine Rolle. Das BAMF schreibt in dem Ablehnungsbescheid an Boran, dass »bei Wahrunterstellung des Vortrages des Antragstellers bzgl. eines Kampfeinsatzes bei der YPG zur Befreiung der Stadt Kobane dies nicht zu einer Zuerkennung der Flüchtlingseigenschaft führen würde«. Das BAMF sieht keine »Gefahr für Leib und Leben«. Die derzeitigen humanitären Bedingungen in der Türkei führten »nicht zu der Annahme, dass bei Abschiebung Folter, unmenschliche oder erniedrigende Strafe oder Behandlung droht«. Auch die Verletzung anderer Menschenrechte oder Grundfreiheiten der Europäischen Menschenrechtskonvention komme, so das BAMF, »nicht in Betracht«. Begründet wird dies unter anderem damit, dass Boran vor seiner Ausreise aus der Türkei im Herbst 2015 sich dort noch einen Pass besorgen und die Türkei legal verlassen konnte. Dies belegt aus Sicht des BAMF, dass er nicht von politischer Verfolgung betroffen gewesen sei. Auch heißt es, dem Antragsteller sei es zwischen seiner Rückkehr aus Syrien und seiner Ausreise aus der Türkei 2015 möglich gewesen, in der Türkei wirtschaftlich tätig zu sein, obwohl viele Menschen in seinem Umfeld von seinem YPG-Einsatz gewusst hätten. Boran gibt als konkreten Fluchtgrund an, er sei ab dem Sommer 2015 mehrmals von türkischen Nationalisten bedroht worden, später habe sein Laden gebrannt. Diese Darstellung hält das BAMF nicht für glaubhaft. Bemerkenswert an der Begründung der Behörde ist vor allem, dass die Entwicklungen seit dem Putschversuch in der Türkei im Juli 2016 offenbar in die Entscheidung über den Asylantrag überhaupt nicht einbezogen wurden. Dass seit Sommer 2016 in der Türkei Zehntausende wegen des Verdachts auf Unterstützung einer Terrororganisation verhaftet wurden – darunter Aktivisten von Amnesty International und eine Reihe von Journalisten – scheint für des BAMF keine Rolle zu spielen. So liest sich zumindest die Argumentation, Boran sei 2015 nicht verfolgt gewesen, da er die Türkei legal verlassen konnte, also liege auch heute keine Gefährdung vor. Brisant ist zudem, dass das BAMF bei der Beurteilung der YPG der Türkei näher ist als etwa den USA. So heißt es in dem Bescheid an Boran, dass »repressive oder präventive Maßnahmen«, die der Staat zur Abwehr des Terrorismus ergreife, nicht flüchtlingsschutzrelevant seien, wenn sie »demjenigen gelten, der Unterstützungsmaßnahmen vornimmt oder sich terroristisch betätigt«. Für die von den USA angeführte Anti-IS-Koallition, der auch die Bundesrepublik angehört, ist die YPG einer der wichtigsten Verbündeten. Als stärkster Teil der kurdisch-arabischen Militärallianz SDF trägt sie seit Jahren die Hauptlast im Kampf gegen die Dschihadisten in Syrien. Die USA unterstützen die YPG mit Waffen und unterscheiden – anders als die Türkei – zwischen PYD und PKK. Die Bundesrepublik ist hingegen seit dem Ausbruch des Syrienkonflikts auf Distanz zur YPG gegangen. Sie unterstützt nur die irakisch-kurdischen Peschmerga, die ebenfalls den IS bekämpfen. Zwischen syrischen und irakischen Kurden gibt es stellenweise Kooperation, aber auch Auseinandersetzungen. So unterliegt Syrisch-Kurdistan einem Embargo seitens der irakischen Autonomen Region Kurdistan. Die Bundesregierung verschärfte im März dieses Jahres das Vorgehen gegen PYD und YPG in Deutschland. So verbot das Innenministerium das öffentliche Zeigen von YPG-Symbolen. Die betroffenen Symbole würden – so eine Erklärung der Behörde – von der »PKK ersatzweise für ihre Zwecke verwendet«. Diese ist – anders als die PYD – in Europa illegal. Die Gesetzesverschärfung war von verschiedenen Seiten als Zugeständnis an die Türkei kritisiert worden. Die nun bekannt gewordenen Fälle abgelehnter Asylanträge erwecken den Eindruck, das BAMF berücksichtige die von der Bundesregierung öffentlich kritisierte Verfolgung Oppositioneller in der Türkei nicht bei seinen Entscheidungen. Die Begründung des BAMF im Fall Boran steht im Gegensatz zu den Worten Sigmar Gabriels von vergangener Woche. Du browst gerade in den efendisizler Weblog-Archiven nach dem Monat Juli 2017.